You want to grow in Christ and share him with your family, friends, colleagues and church—so do we. That's why we publish practical ideas on how to live as a disciplemaker. 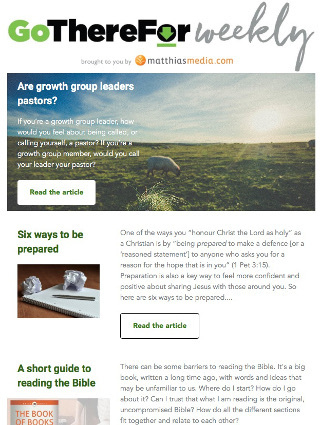 Every week we send out an email with links to new articles and other helpful information for Christians who want to seek God's kingdom first, plus the latest news about Matthias Media resources. Please note: We won't provide your email address to anyone else, and you can easily unsubscribe at any time. Please note: Spam filters can sometimes prevent legitimate emails like ours getting through to your inbox. If your spam filter allows you to 'white list' us (i.e. add our email address to a list of senders that will be not be caught in the spam filter), we'd encourage you to do this. We don't send spam, only emails with articles and information on Matthias Media resources, and as soon as you want us to stop sending them to you we do. Want a sneak peek? Here's the last newsletter that we sent.